1917.14.33 Rolling pin from Sunderland, said at one time to contain a caul. Object Catalogue Number 1917.14.33: Glass rolling pin, which may have once contained a caul. Like a fiend hid in a cloud"
Extract from the poem Infant Sorrow by William Blake. Birth is a fraught and dangerous time and objects associated with it often take on deeply symbolic meanings. No object could be more imbued with superstitious potential than a piece of birth-associated human tissue. The Pitt Rivers Museum has several such objects including an object described as a 'Glass rolling-pin, painted and dated 1855; said to have contained a child's caul as a sailor's charm, Sunderland' [1917.14.33] which is described in our public web-based catalogue as a "food accessory, amulet and human body part". For me this object encapsulates the diversity and complexity of the Museum's English Collections. The object is located in a drawer in the Museum Court, amongst other amulets and charms, and takes the form of a hollow smoky-glass rolling pin painted with a picture of a ship in full sail. I have been fortunate enough to closely examine the rolling pin and it is painted with a ship in dark brown with light tan sails on a green sea and associated green floral designs plus what may have been an image of an anchor. Now badly worn, the paintwork on the rolling pin includes the phrase "a gift from Sunderland 1855" (or 1856). 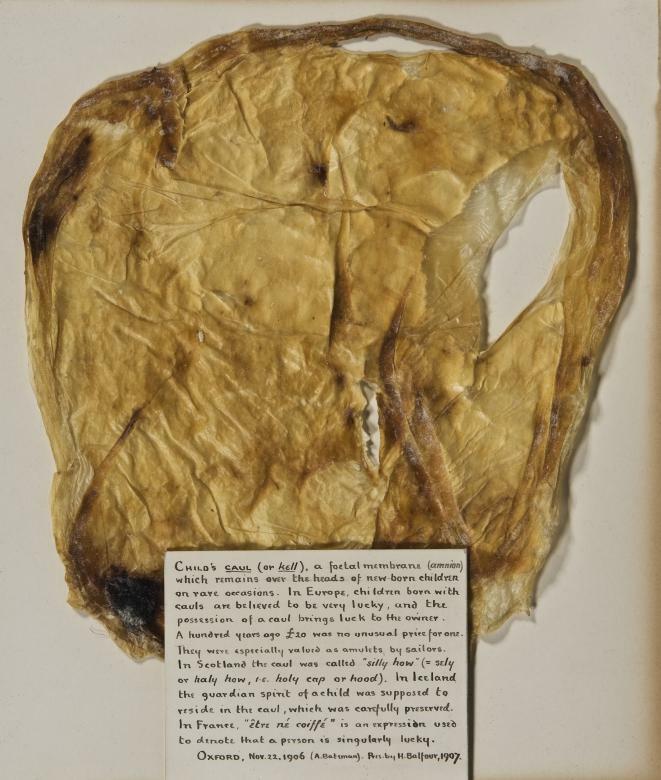 It is thought to have once contained a child's caul but is now open at one end and clearly hollow and empty - however the association with a child's caul remains and it is that which I explore herein. 1907.1.13 Mr A. Bateman's child's caul. Babies born 'in the caul' (when their amniotic sack, or amnion, has not burst and remain intact on the babies head or face like a circular crown) are in many instances worldwide thought to be lucky, special or protected, and according to Wikipedia, children born in the caul are rare, occurring less than one in every thousand births. It may be both the rarity of occurrence and the watery symbolism of the amniotic fluid that led to both the children born in the caul, and those subsequent bearers/wearers of the caul as a charm, to be deemed, specifically in English folklore, as subsequently unable to drown (JSTOR: Folklore: Vol.61, No.2, p.104). Will wed, hev bairns & rear 'em all. Will loose her caul & young will die. For ill luck on her will fall. Ill-deed his lot for many a day" (Fairfax-Blakeborough, 1923). The date of the particular object in our collection is given as around 1855 (based on the date painted on the rolling pin's exterior) and this was when it seems such beliefs were at their apex in England with several references in the press, such as this example from the London Times in 1835: "A Child's Caul to be disposed of, a well-known preservative against drowning, &c., price 10 guineas" (Moore, 1891). As I have outlined, throughout Europe, but especially in the U.K and Iceland, such cauls were believed to protect their owners from drowning and in some instances other forms of danger. For example, In Iceland the guardian spirit of a child was supposed to reside in the caul, which was carefully preserved after birth and kept. In France, the expression "etre né coiffé" is used to denote that a person is singularly lucky (Notes taken from DCF Court Team Catalogue notes 5/3/2003 for PRM no 1907.1.13, & Henderson 1879 p. 22 ). A related object in our Museum Objects collection ( 1907.1.13) is described as a 'child's caul (or 'kell' as they are called in Scotland)". This particular caul has been rolled out and is presented flat in a small frame pressed to paper behind glass, where it can clearly be seen to be human tissue, as it is a strong but thin membrane of a circular shape with a small hole on the upper right-hand side. This particular example was acquired by Henry Balfour for the Museum in 1907 and came from the birth of a John Simmons in Oxford on November 22 1906. This object was lent by Mr Lovett on October 2 1916 for an exhibition at the Wellcome Historical Medical Museum exhibition, when it was noted in The Observer Newspaper on the 1 of October 1916 : "Before the war Mr Lovett was able to buy a child's caul for his collection for 1/6. Today owing to the submarine peril, the price for this charm against drowning is £2 or more." (Catalogue Record for PRM1907.1.13). In another source it is stated that 'when the submarines got to work' the price of such cauls increased to reach 3 guineas for a time (About £3.3 modern pounds) (Fairfax-Blakeborough, 1923). The belief has not long died out in Oxfordshire - as late as the 1950s people still believed in the powers of such cauls. In 1954 in Banbury a midwife offered a new mother the high price of £10 for her child's caul as the Midwife wanted it for a sailor (Bloxham, C 29/11/07 and Hole, 1957). Such beliefs were not restricted regionally as Henderson, in his volume on the "Folk-Lore of the Northern Counties" of England, also describes a sailor paying fifteen pounds in the early 19th century and how that sailor then kept the caul as a preventative talisman for 30 years. In addition, Henderson also describes an instance, from the North of England, where a servant kept the caul from her birth and consulted it in an oracular fashion all her life, fearing that loosing it would bring about her own death (p. 22 -23). The beauty of this object for me is its complex symbology and associations with the sea. Sailors highly prized cauls for their protective powers against what was often their greatest fear - drowning. Seamen also started presenting glass rolling pins to loved ones on their return home from far-flung lands and they also saw rolling pins as charms in their own right. Glass rolling pins, such as this example, were easily suspended by their knobs at either end from hooks and also provided good materials with which to inscribe or paint sentiments. Our example probably originated in the Tyne and Wear/Sunderland Area and this seems to be paralleled by other examples from Newcastle in the 19th Century, as this area was then a centre of industry and shipping ( http://nq.oxfordjournals.org/cgi/reprint/s9-III/66/245-d.pdf ). As a gift to a loved one such a rolling pin, if it contained a caul, would have been a gesture of a deeply protective nature. In summary this object, for me, engages with human fears and wonder surrounding the mysteries of birth and I imagine that as a sailors talisman it would have seemed a rare and precious charm against the terrors of the sea. Bloxham, C. 2007. "Births, Death and Marriage": Vale and Downland Museum - Local History Series - 29/11/07. Henderson, W. 1879. Notes on the Folk-Lore of the Northern Counties of England and The Borders . London: W. Satchell, Peyton and Co.
Richardson, R, 2002. 'Copperfield's caul', The Lancet 2002: 359:2209. DOI:10.1016/s0140-6736 (02) 09102-X.